The Siemens Synthesiser or ‘Siemens Studio For Electronic Music’ was a German development similar to the RCA Synthesiser originally to compose live electronic music for Siemens’s own promotional documentary films. Like the RCA MkII, The Siemens Studio was a modular ‘composition and synthesis system’ that generated musical sequences and synthesised and recorded the results. The Siemens Synthesiser was developed by Helmut Klein and W.Schaaf at Siemens Halske in Munich, Germany in 1959 for the Studio Für Elektronische Musik in Munich. 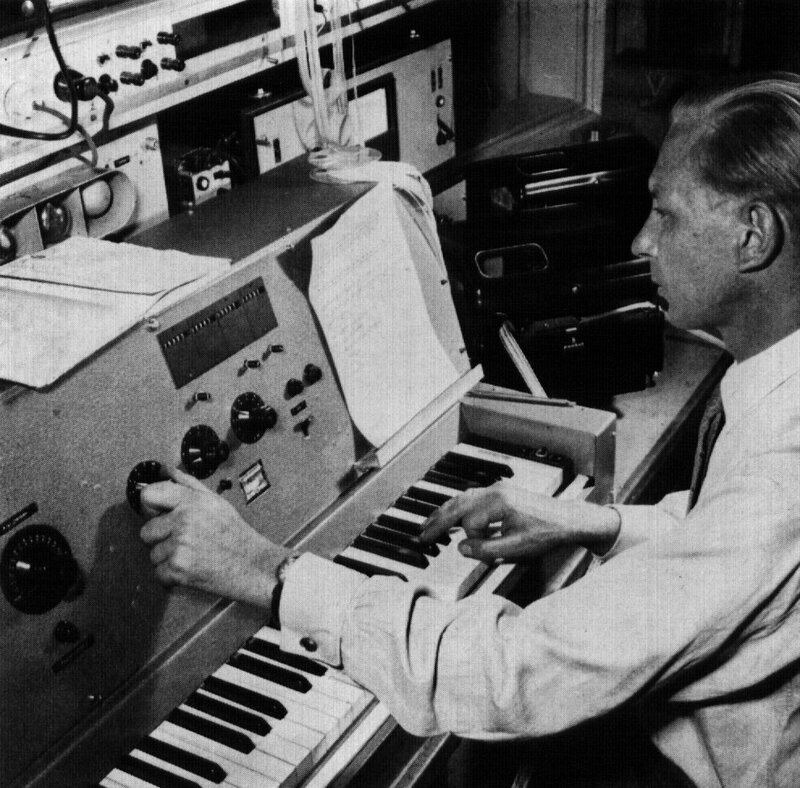 The Siemens system linked and controlled the studio using a similar system to the RCA Synthesiser, a set of four punch paper vari-speed rolls controlling the timbre, envelope, pitch and volume of a bank of 20 oscillators, a white noise generator, a Hohnerola (a hybrid electronically amplified reed instrument marketed by Hohner-similar to the ‘Multimonica‘) and an impulse generator. The synthesiser had a tonal range of seven octaves. 20 special sine generators. These generators a 3 frequency spectrum, from 1r5 – 160 Hz, 150 – 1600 Hz and 1500 – 16000 Hz, with the option of continual change from sine to square wave. 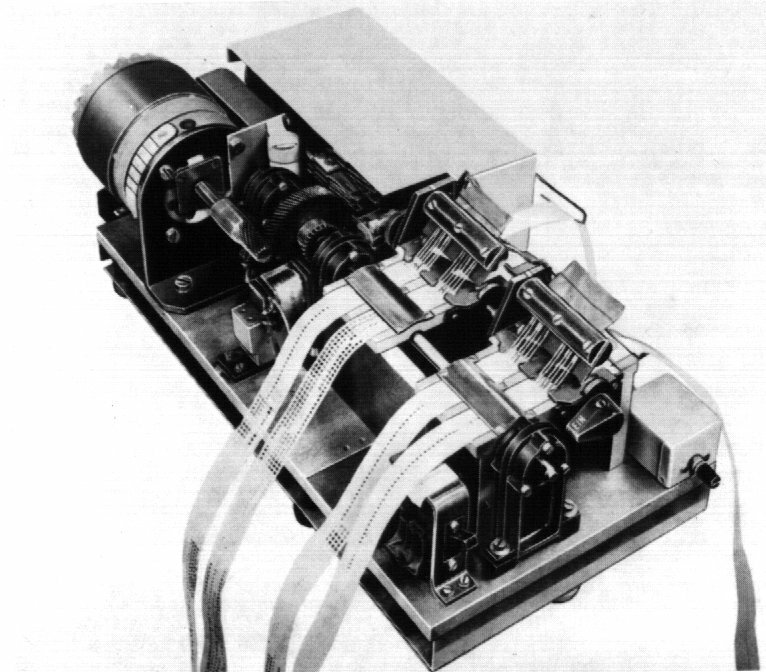 Additional input devices were also developed for the Siemens Synthesiser; a drawn sound technique (photoelectrically generated sounds) allowed the scanning of photographic slides using Siemens’s specially designed ‘Bildabtaster’ technology. The German painter Günter Maas used this device to translate several of his paintings into musical compositions. Later models also had a Siemens Vocoder built in as a sound controller uniquely for its time, allowing the musician to give the sound vocal envelope characteristics. 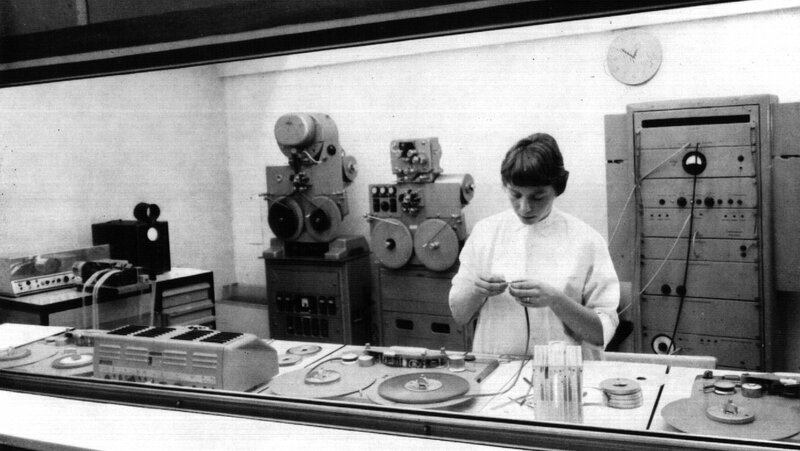 (L-R:punch-paper controller, 2 four channel magnetic tape recorders, ‘Bildabtaster’ picture-scanner. The development of the Siemens synthesiser continued after the Munich studio had relocated to Ulm and came to an end when the studio was dissolved in 1969. 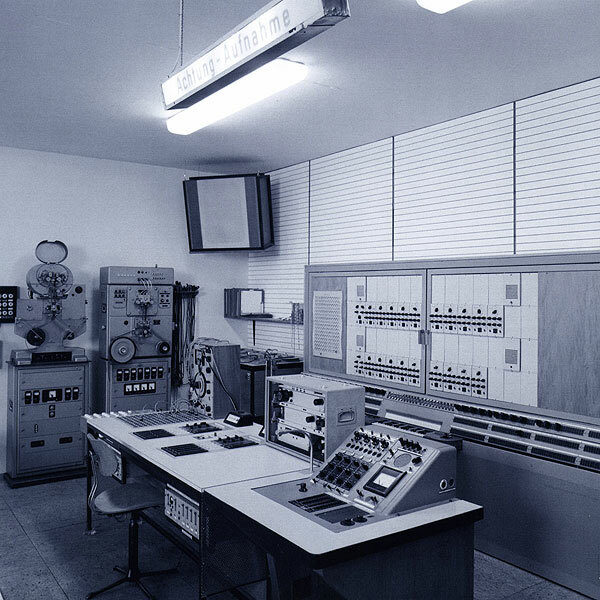 The Siemens system was used by many European experimental composers throughout the 50’s and 60’s including Mauricio Kagel, Bengt Hambreus, Milko Kelemen and the director of the Munich Studio Für Elektronische Musik, Josef Anton Riedl. A synchronous-motor moves the paper strips across the reader. The 4 parallel moving strips are read by removeable steel wire brushes. The system can also be run in reverse. Pitch: The pitch is defined by two strips. One strip chooses the octave, the second the tones within the octave. There are 7 octaves , and 12 tones within those octaves, making 84 tones in total. They can be chosen in fixed tuning with the electronic tuner or in a tuning that can freely be chosen with the impulse generator and sine generators. Combinations allow the choice of several different generators. Volume: The volume can be defined in 32 steps of 1,5 dB. Duration: The duration of the signal is defined by the number of equal hole combinations in connection with the reading speed of the punch-paper strip. There are three different speed settings of the paper strip, 64, 90 or 128 signals a second. The normal speed is 64 signals per second, i.e. a duration of 16 ms per signal. The duration is a quarter note, played in Mäzel’s Metronome MM = 120, is 0,5 s which equates to 32 equivalent hole combinations, an eighth note is then 16, a sixteenth note 8 hole combination. H.Klein:”Uber ein Apparatur zur Steuerung und Verformung von Klängen”,Nachrichtentechnische Fachberichte,cv(1959),31 Répertoire international des musiques expérimentales (Paris,1962),36. Images and details provided by Siemens Aktiengesellschaft, Siemens Forum, München. eure seite ist wirklich toll,…. bis auf die filmchen ,die solltet ihr unbedingt entfernen .im gegensatz zu eurer wirklich kompetenten seite wirken die filme ausgesprochen diletantisch. …..wer hat die denn gemacht ? this web site contains remarkable and really good information in support of readers. Thanks for finally talking about >The Siemens Synthesiser H.Klein & W.Schaaf.